The landmark theater is getting a date with a wrecking ball. In case you missed it, The West Erie Plaza Theatre has a date with a wrecking ball. 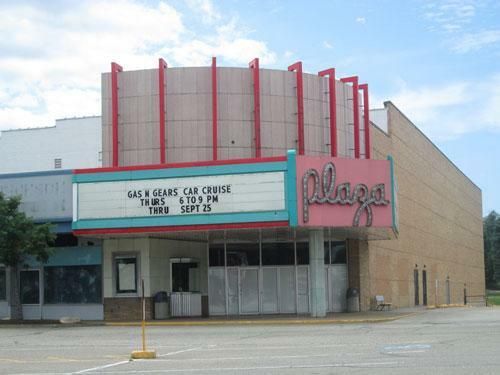 As recently reported in the Erie Times-News, VCP Properties – the Erie-based company that owns the plaza – has elected to raze the theater that shuttered its doors six years ago, reportedly due to "sluggish tickets sales." When I first read John Guerriero's article, I was saddened by the loss of the landmark sitting off of the corner of Pittsburgh Avenue and Eighth Street. But then that sadness turned into confusion. How could a theater located in a neighborhood ripe with recent development not have a future worth investing in? I was also troubled by two quotes in the Jan. 24 article. Chris Conrad, VCG's co-managing director, said that, "It is with great sadness and profound regret we must accept our inability to save the plaza theater." This struck me as strange. Yes, the ETN article reported that "no companies came forward to commit to the theater's revitalization," but was this enough to make this a conversation stopper and destruction the inevitable answer? The other quote that had me scratching my head even more came from Chris Greene, the other co-managing partner: "Our concern is that investment into first-run or second-run theaters is increasingly seen as an unfavorable investment." Two other words lingered on after I finished reading the doom-and-gloom report: Resistance and hesitation. Both were reportedly in regards to the theater industry. But since the West Erie Plaza closed, Erie's seen young entrepreneurs prospering in both first- and second-run theaters – FILM at Erie Art Museum and Erie Movie House both come to mind. So given VCG's rationale to raze the theater coupled with my observation of recent development, I got on the phone. The first two calls went out to John C. Lyons, the executive director of Film Society of Northwestern Pennsylvania, and Craig Stadler, the owner/operator of Erie Movie House. While Tinseltown houses more than enough screens – and a lot of flicks – many of the more critically acclaimed films don't appear there until Oscar time. FILM at the Erie Art Museum – one of the programs of the Film Society – is approaching its third anniversary and fills this void steadily throughout the year, having also brought in 18 live filmmaker Q&As, hosted eight movie premieres in Pennsylvania, and managed to hit their capacity of 200 seats multiple times – all done as a nonprofit with a handful of dedicated volunteers. So when VCG turned to Facebook to sound a call to arms for "local heroes big and small" looking to talk film, John was there, ready and willing to make something happen. He posted a comment to start a dialogue, pointing out that the Film Society was designed to address questions and concerns like this one involving a brick-and-mortar location; yet John – and the Film Society – never heard back from VCG. "I think that to a lot of people, maybe those who aren't connected at all to the film industry, it may seem daunting," John explained. I confess that opening a movie theater does sound intimidating, but it is possible. He added that many people would likely simply wait for one of the four major theater chains to show up before anyone would believe it possible to open – or re-open – a theater. John said some hold the opinion that "No one has ever started an independent, boutique, theater on their own… which is garbage." But while John got no response, Craig, the owner and operator of the small, independent theater Erie Movie House told me another story. Craig looked into the West Erie Plaza on two separate occasions over a two-year period. Each time, he and his wife and business partner Nicole were not allowed to see the inside of the building and they weren't allowed to purchase/salvage seats. "The offer put to us was a scraping of the insides of the building, leaving us with just a shell. We would have to pay for a full reconstruction project, along with fixing the roof, which caused the damage initially, along with a five-figure-per-month rent," according to Craig, who admitted that this didn't match the budget he was working with at the time. So ultimately, he had to go elsewhere and start smaller, ending up at 3424 West Lake Road. Erie, while a small city, is full of young entrepreneurs looking for reasons to stay. Surely, there are enough innovators and investors to figure out a way to mimic the success of independent theaters found elsewhere in the country. The Bryn Mawr Film Institute based out of Philadelphia conducted a survey of small theaters (average two screens, 300 to 500 seats), and as it turns out, three-quarters of those theaters are nonprofits. In San Francisco, there are 20 theaters in the city, half of which are not chains and many are moving over to nonprofits which also run benefit events and offers membership programs to help drive growth. It seems like either being a nonprofit or partnering with a nonprofit opens theaters to many new financially-viable avenues including grants. So I have to ask again, why can't this happen in Erie? Why is the ultimate answer destruction and not further conversation to explore re-purposing a theater into a theater-based venue? We have both FILM at the Erie Art Museum and Erie Movie House, but there's also Mercyhurst Institute For Arts & Culture, Big Green Screen Theatre, and Edinboro Film Series in the discussion. Each of these endeavors fills a niche and each continues to grow, suggesting that Erie has a penchant for – and can support – multiple movie options. Many questions still remain as to the intentions of VCG in regard to the West Erie Plaza. From talking to both Craig and John, it seems as if there was never a real intention to save the West Erie Theater. While I reached out to VCG for comment, I didn't receive a response before deadline, but I am still waiting, hopeful for comment. As we mourn the loss of yet another potential business opportunity for our young and eager entrepreneurs and community leaders, go to – and continue to support – any of the aforementioned film programs in Erie. This will continue to spread the message that Erie is a city that respects and loves movies – one that developers will see and hear.